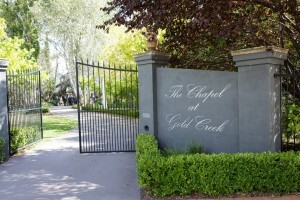 The Chapel at Gold Creek is a leading Canberra wedding venue that caters for a range of events. Light catering is available with all services. 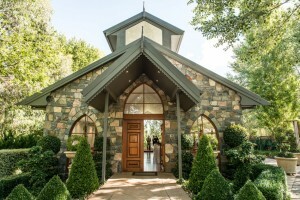 The Chapel at Gold Creek’s gardens are also available to hire for photographic sessions, and ceremonies of all types can be held either in the gardens or in the Chapel itself. 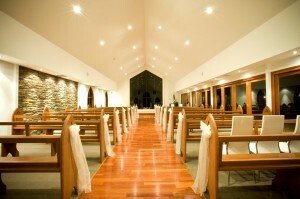 For Canberra wedding ceremonies or other function types please contact The Chapel. Chapel (2hrs) – Includes: White chiffon bows, floral arrangements, signing table and pen, your initials in white letters, 45min rehearsal, music & sound system. Non-refundable booking fee of $350 required to book this package. Remaining payment is due 30 days prior to your wedding. Pop up weddings are designed for those wanting a very small wedding (up to 40 guests) and are a great option for couples who are eloping or who are looking for an alternative to a registry office wedding. We provide a celebrant to conduct a simple yet personal ceremony, and a photographer. We can even provide witnesses! Pop up weddings only take 45 minutes and you will be married and have beautiful photographs to show friends and family. Photographer or Videographer (45min) – A professional photographer or videographer during your 45min package, photos/video edited and presented on a USB at high-resolution ready for printing or viewing. Non-refundable booking fee of $700 required to book this package. Remaining payment is due 30 days prior to your wedding. Videographer – $600 Have a photographer with ‘The Intimate’ package but also add on a videographer too. A professional videographer during your 45min package, video edited and presented on a USB in HD ready for viewing. Wedding Dress Hire – $600 A range of gowns to choose from between sizes 6 – 26. All gowns include alternations and cleaning. Flowers – $150 A simple posy of seasonal flowers and a matching buttonhole. Non-refundable booking fee of $880 is required to book this package. Remaining payment is due 30 days prior to your wedding. Videographer – $1000 Have a photographer with ‘The Essentials’ package but also add on a videographer too. A professional videographer during your 2 hour package, video edited and presented on a USB in HD ready for viewing. Canapes – Cold platters (50 People) includes options of antipasto, cheese, fruit, and open sandwich platters for 50 people. Non-refundable booking fee of $1450 is required to book this package. Remaining payment is due 30 days prior to your wedding. Canapes – Hot platters (50 People) includes options of 4 hot canapés for 50 people. Live Ceremony Music – 4 acoustic songs during your ceremony: 1 aisle song, 2 signing songs, and 1 recessional. Non-refundable booking fee of $4200 is required to book this package. Remaining payment is due 30 days prior to your wedding. Chapel (1.5hrs) – Includes: White Chiffon bows, Floral Arrangements, Signing table and pen, Your child’s name in white letters, Music & Sound System, Alter and font by request. Non-refundable booking fee of $200 required to book this package. Remaining payment is due 7 days prior to your event.